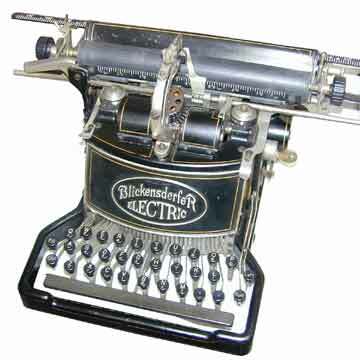 The Virtual Typewriter Museum is dedicated to manual typewriters, and the Blick Electric is the only exception to that rule. This machine deserves its place here because it was literally half a century ahead of its time. It had the features that IBM was proud of in the 1950s, including the typewheel. But because it was ahead of its time, it failed miserably. The Blick Electric was a truly revolutionary machine when it was introduced in 1902. The machine had all the characteristics of the manual Blickensderfers, plus a QWERTY keyboard and all the advantages of the later electric typewriters: light touch, even script and automatic carriage return and line spacing. The machine was driven by an Emerson electric motor that was mounted on the rear and switched on by turning a Yale doorlock key on the side (pic 6). Read all about this typewriter in The Five-Pound Secretary - An illustrated history of the Blickensderfer typewriter. Available through our online bookshop. It is unknown how many of these Blick Electrics were actually built and sold but it cannot be a large number. Despite intensive, international marketing, only three Blick Electrics are known to exist today. And that is not because they were bad machines. The machine shown here is still switched on regularly and hasn't had any maintenance for the past 100 years. There has been much speculation about the reasons why this amazing machine was no success. One theory has it that production was halted because it wasn't possible to serialize production. After all, electricity in general hadn't been standardized at the time. Currents differed from city to city. Another theory says that the general public just wasn't ready for electric appliances in 1902 and may have been afraid of the machine. This theory is illustrated by a 1917 author who (paid by Underwood that had not perfected its own electric typewriter yet) said that the electric typewriter was not likely to become popular, because it 'would eliminate to a great extent the human element'.